As busy women, we often do not recognize the importance of a written planning for our families and loved ones should something happen to us. Or, we think we're too young, or not rich enough, to plan now. Frankly, some of us simply do not want to think about death. Guess what? None of us will live forever. If you are reading this, you still have a window of opportunity to plan your affairs. That window will close for all of us eventually. Unfortunately, we do not have a crystal ball to know when our window of opportunity to plan will close forever. 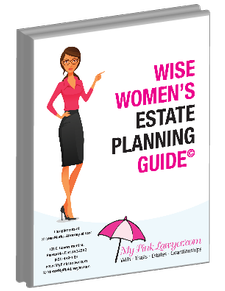 Download your free Wise Women's Estate Planning Guide now to help you get started. This guide is a great first step to begin your planning process.